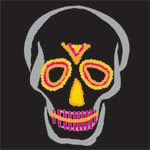 Here’s something a little different – the San Francisco Symphony is sponsoring a Dia de los Muertos (Day of the Dead) family concert on Sunday, November 2. The theme is Latin culture (shocking! ), and conductor Enrique Arturo Diemecke will lead violinist Danielle Belen Nesmith and bandeneon player Peter Soave in works by Ravel, Gamboa, Piazzolla, Moncayo and more. Before the show, enjoy 17 traditional artistic Altares de Muertos (altars), Aztec dancers, traditional refreshments and free face painting.